Those that have leg, knee or ankle injuries. You ride faster, glide up hills, and cut journey times to work. Read rider's testimonials to check out rider's feedback. Contact us on 07973 499224, or via our contact form to discover how we help your employees. Note, that even if your battery runs slightly low, the bike has six gears for you to pedal relatively easily back to base. Take the sweat out of cycling. Why not join the electric cycling movement sweeping across Europe! Encourage them to migrate from motoring to cycling. Staff can also use the electric bikes for personal activities, e.g. at lunchtime. They'll feel more integrated into the city, and benefit from its amenities. Your perceived value as an employer increases. You could lend your electric bikes to visitors, customers and partners. They would all gain easy mobility around the city. The e-bike Cambridge has already been used by over 70 people working at the North Cambridge business parks. Employees can pick up these bikes, for free, from Milton and Longstanton Park & Ride. Staff can book an electric bike for any week day. Try something new today, try e-bike Cambridge! The government-supported Cycle to Work initiative encourages staff to purchase bikes, including e-bikes. It has tax advantages for employer and employee. Employees enjoy significant savings when purchasing new bikes. An employee selects a bike, and hires it for an agreed period from one of the government-approved agencies. When the hire period expires, the employee purchases the bike at a second-hand value. The hire costs are paid out of gross pay, not net pay. Hence there is an income tax and Employee National Insurance saving. Cambridge Electric Transport is a member of Cycle Solutions. “I had a lovely ride yesterday. I was so pleased that I managed to cycle up a hill that I could never cycle up in Linton before without nearly killing myself with a basket full of shopping. “I just want you to know that I am so enjoying my new e-bike!!! it's great!! I actually cycled up Castle Hill effortlessly yesterday and now think nothing of setting off to go anywhere. Take your environmental responsibilities seriously. 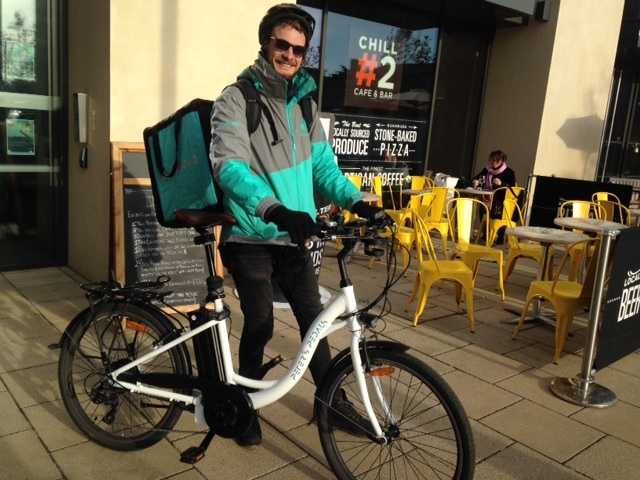 Cambridge Deliveroo rider goes "Faster, fresher, further" with Peter's Pedals electric bike.